Not unlike many other premier & 1st division grounds. Inside this is how I think a stadium should look - unlike other grounds e.g.. Portman Road (...our reviewer is an Ipswich fan!) which is very much a '70s ground or some premiership grounds which have one or two massive stands to increase the capacity but serve to reduce the atmosphere and make the players look like subbuteo figures from the back of the stand. All four sides of the ground are the same height giving it a nice symmetry, corners filled in, therefore totally enclosed which adds to the atmosphere, which is often missing in the new 'all seater' world. Upper tier, where we were was quite steep, but I didn't hear any complaints and did give a good view over the whole of the playing area. Jumbotron screens at each end of the ground - continuous coverage of the game which is a novelty to start with, but does become distracting after a while. No replays of contentious issues though and only premier league results and half times shown. The away supporters were located in the corner of the south and west stands, In both the upper and lower tiers. The food served at the ground was adequate, with Pasties (from original pastie company), tea, coffee, bovril, soft drinks and alcohol. Take A406 North Circular to Edmonton and at traffic lights follow signs for Tottenham (A1010-High Road) for ground. The following bus services frequently pass the ground: 149 Ponders End Garage to Liverpool Street Station. 259 Edmonton Green to King's Cross. 279 Waltham Cross to Holloway. Piccadilly Line - Manor House. There is limited car parking in surrounding streets (risk of clampers). We suggest that you park at a train station north of the ground and get a train down. This bar is located on 271 Fore street, Edmonton (020-835-05329), and is Away Fans Only!. This friendly, modern bar is situated approximately 10 minutes walk from White Hart Lane. There is coach parking available if booked in advance and there is food and refreshments free of charge for the drivers. Only bookings taken through the official fan club accepted. Turn left out of White Hart Lane into Tottenham High Road. approx. 30-40 yds. Without going a long way from the ground probably best pub within 10 mins walk. 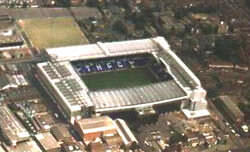 This pub is located between the junction of White Hart Lane & Tottenham High Road, and the ground (home supporters only). Contains a large vocal contingent of spurs fans. If you are a registered user then you can login, and create your own personal review of Tottenham Hotspur Football Club - White Hart Lane. These reviews can be private or public.